We are Kimberly Alexander and Melissa Sher, two self-proclaimed "adventure-seekers" and avid participants in the wide world of the outdoors. We can't wait to meet you! Kimberly brings an enthusiasm to her coaching based on the belief that a strong community depends on having positive, fit, and healthy members. Oh yeah… and that moving is fun! Hard work, intensity, and tenacity tempered with the ability to laugh at yourself, have fun, and not take life so seriously are standards at POINT. Kimberly’s idea of fun involves anything active, and preferably outdoors. 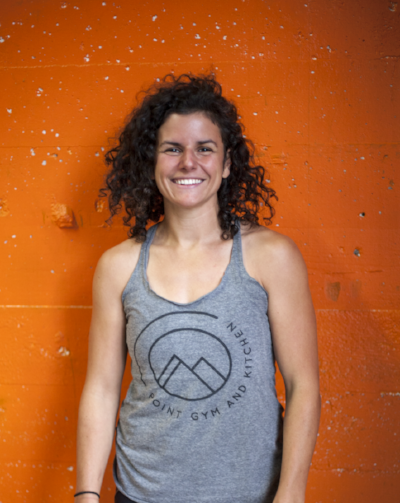 From traditional sports like soccer, biking, and trail running to other outdoor adventures like SUP, mountaineering, rafting, and skydiving, she is always down to try something new. 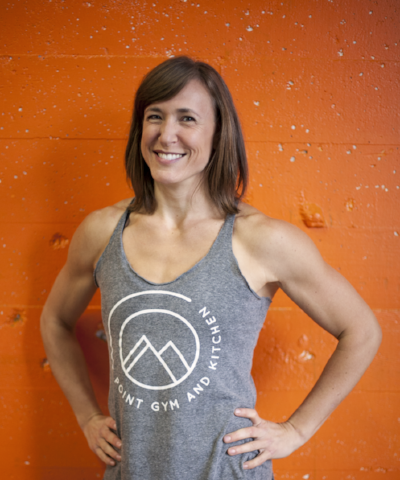 Committed to being a well-rounded and knowledgeable coach, Kimberly has completed a variety of certifications, most recently MovNat Levels 1, 2 and 3, Primal Vinyasa, and her Nutritional Therapy Practitioner certification. Other certs include CrossFit, Kettlebell, 300hr Yoga, Personal Training, Indoor Cycling, and her NASM Personal Training certification. 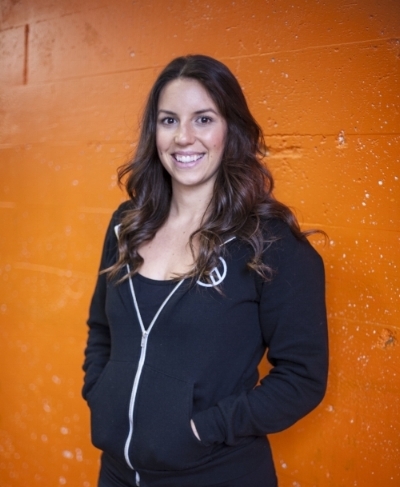 She has been coaching in the fitness industry since 2003. Kimberly grew up in a “health-conscious” home in the 80’s and 90’s, when healthy meant Snackwells cookies, Gold 'n Soft Margarine, Basic 4 cereal, and corn was still a vegetable. Despite the bad information, Kimberly was fortunately still indoctrinated with the message that eating well and being healthy are important, even if our practice in this arena was flawed. Over the years in the fitness industry Kimberly became sick of all the messaging that we should eat a certain way in order to look a certain way. Kimberly became a nutritional therapy practitioner to help people embrace being strong and competent over hitting a target weight or size or “look.” She dove headfirst into the actual science of nutrition and what it actually takes to heal the damage we have all done to ourselves in the past, nourish our bodies for optimal health, and fuel our bodies for the fun activities we will explore in the coming years. Prepare for conception and pregnancy. Mitigate stress and issues with sleep. Follow Coach Kimberly on Instagram! Melissa is an outdoor adrenaline seeker with main passions in the fields of cyclocross, mountain biking, trail running, rafting, and mountaineering. Since moving from Missouri to the Northwest in 2008 Melissa can't get enough outdoor adventure. She knows the value of variety in training to improve in a particular sport. She uses strength and agility training to facilitate her performance in each of her endeavors. hiking vacations all over the United States, in addition to guiding whitewater rafting trips in Oregon and Washington. Melissa has been a certified personal trainer since 2008, specializing in high-intensity plyometric training and weight-lifting for the improvement of athletic performance. She is a MovNat Level 3 Certified Trainer and a Certified Nutritional Therapy Practitioner. When Melissa was a kid she "got away with" eating whatever she wanted. “If you look good, you're healthy” or “If you exercised you can eat X,Y, and Z.” This is too often the line of thought in today's society. Growing up in Missouri, where her diet was a lot of refined carbs, a lot of fat-free milk, badly processed meat, and some vegetables at dinner, she couldn’t see the damage this diet was doing because she wasn’t gaining weight. It was when she started to gain weight in college as her activity declined and late night pizza and beer increased. When Melissa moved to the Pacific Northwest, she began to learn and experiment with foods and varying types of movement. She read every book, watched every documentary, and eventually became a nutritional therapy practitioner which aligned with her developing thoughts of supporting people's bio-individuality through a properly prepared, nutrient dense, whole food diet. People seeking weight loss for health reasons. People looking to improve athletic performance through nutrition. Follow Coach Melissa on Instagram! I grew up in the kitchen where I learned the love language of food. I was raised by a father who is a classically trained French chef and was the owner of his own critically acclaimed restaurant, and by a mother who practices as a naturopathic physician and certified nurse-midwife. Due to their incredible influence I have always placed great importance on the quality of my food and had a passion for holistic health. questioning and discovery, and ultimately to the pursuit of a career in the world of nutrition and therapeutic movement. I believe in a holistic approach to nutrition and movement, that addresses each person’s bio-individuality. Every one of us is unique, and because of this I work with each client to discover what works best for them and fits in with their lifestyle and goals. It is my mission to give my clients the information and guidance they need to make educated decisions about their own health and their futures. To guide them in gaining a deeper understanding of themselves with both an internal and external approach. When we have knowledge, tools and support our ability to effect change can be exponential as well as lasting. I am a Certified Nutrition Therapy Practitioner, a 500hr Certified Yoga Teacher and a Holistic Yoga Therapeutics Practitioner. I specialize in pre- and post-natal nutrition and supporting people with depression and anxiety through nutrition.